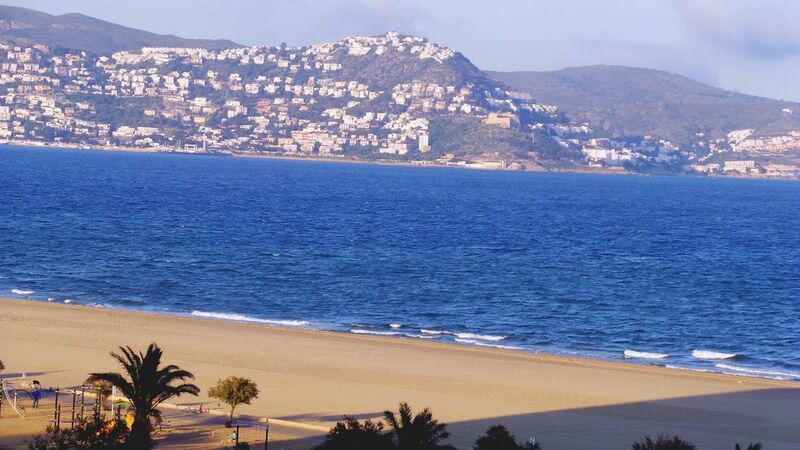 For rent bright apartment, 2 steps from the beach with a beautiful view of the sea and the Bay of Roses (Costa Brava). Empuriabrava is located 40kms from the border and 10kms from Rosas (Spain). This beautiful apartment is composed of 3 rooms. It is completely renovated and refitted. It is spacious and suitable for 4 people. - 2 single rooms: one overlooking the balcony with 2 beds of 80 (that can be moved closer or apart) and in the other room, there is a bed of 140. The area of ​​the day area is 24m2 with balcony of 8 m2, seafront: ideal for dining in front of a magnificent view of the sea and the bay of Rosas (very well "lit" in the evening). The equipment included are: radio-K7-CD, DVD, TV with all French and Spanish channels. There is also an optional numbered parking space in a closed underground car park. This is strongly recommended from June to September because on the boulevard, parking is paid from mid-June to mid-September. Other local activities: parachuting, boating, sailing school just down the apartment and playground & sports for young and old also in front of the apartment. Conveniences nearby: shops, restaurants, market (Saturday morning): everything is feasible on foot!